Project Project: Back from Disney World! Meeting the Mouse himself. Espen was starstruck, Gwen was skeptical. If things have been quiet around here lately, it's because we just got back from a week at Disney World! And Legoland. And the beach. It was a lot of fun, especially seeing how much the kids enjoyed themselves. 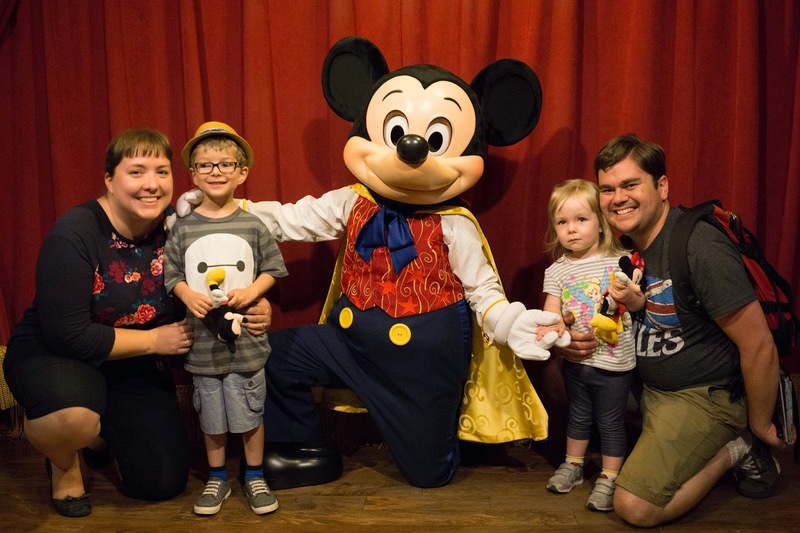 Truth be told though, I think that even better than meeting Mickey and riding Splash Mountain was getting to spend a whole week adventuring with Grandma and Grandpa. Nick's parents invited us to join them, and of course we leapt at the chance! We even managed to keep the trip a secret from the kids for almost a year while we planned and made our preparations! Some of my favorite memories include a perfect day spent at Cocoa Beach, fulfilling my childhood dream of seeing Cinderella's castle in person, watching the Epcot Fireworks from a boat on the lake, going on "safari" at Animal Kingdom and so many moments of seeing joy and wonder on my kids' faces. And seeing Gwen going into complete fan girl mode when she saw Minnie Mouse in a parade! So hot, tired and sweaty, but still having lots of fun. I have to admit that I enjoyed myself a lot more than I was really expecting to. I haven't really been too much of a Disney fan since I reached adulthood, and while I like theme parks well enough, I just haven't really been to that many. I'm more of a museum, sightseeing and 'getting a feel for what it might be like to live there" kind of a traveler, so six parks in six days was a huge departure for me. And I surprised myself by actually really enjoying it! There was so much to see and do, and everything is so well-run to keep frustrations at a minimum. You're never more than a few steps away from a bathroom, a drinking fountain or a place to sit down, which is much appreciated in hot and humid Florida, especially when you're walking and standing as much as you do in a place like Disney World. On the pier at Cocoa Beach. I have to admit though, that as fun and amazing a time as we had at Disney World, I think my favorite day was the one we spent at Cocoa Beach. We all woke up well-rested after sleeping a 12 hour-night (I haven't done that since college! ), ate a tasty breakfast at the hotel, and then headed over to the beach across the street. Nick and I left our phones and cameras in the car, and just played with the kids in the sand or the water and took turns boogie boarding. It has been a long time since the four of us have just relaxed and had fun together without any responsibilities or distractions taking our minds off the here and now. And it was a really nice, family-friendly beach filled with happy and friendly people, which was nice. Plus being right by the pier for bathrooms, lunch and a quick shower at the end of the day was so so great, especially for a family with small children. The best part, though, was just spending time together and sharing something that I love (the beach!) with my family and seeing how much they loved it too. Gwen is still requesting that we go back! Legoland where everything is awesome. Now we're home again and just about back to normal. That is, back to normal until school gets out in three weeks and our routine goes out the window again! But for now it feels good to sleep in our own beds, have more than four outfits to choose from and not eat out all the time (I swear at least one of the kids somehow managed to have pizza just about every day we were gone!). Isn't it funny how some of us (me!) have this need to counterbalance having a lot of fun and excitement with something familiar and low-key? "I've had too much delicious food lately, can't a girl just get a bowl of cereal? I've spent a week having crazy amounts of fun at five different amusement parks, when do I get to watch Netflix in my jammies?" And it's not just adults that can't keep up either: our kids would get back to the hotel after a day of wall-to-wall fun, and just want to sit down with the iPad or play Legos for a while. Having said that, I will also say that I started planning our return trip to Orlando on about the second day. We want more beaches and swimming pools and Tinkerbell and parades and live shows and rollercoasters! But in five years or so, when the kids won't need strollers, are both tall enough for all of the rides, can stay awake past 8:30 PM and my legs have forgotten how tired they were after a week of walking. Then we will be back for more! Turns out there is a Disney fan in me after all.